Get the Venison Lau Lau recipe featured in Family Ingredients on PBS. Make a stack of 6 luau leaves, layering with the largest leaves on the outside and smaller leaves on the inside. 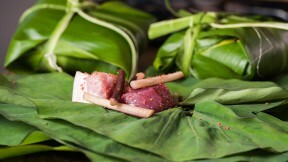 On top of the leaves, place two pieces of venison and one piece of salted pork in the center. Sprinkle with a pinch of Hawaiian salt. Wrap the bundle by bringing up the left and right sides, then folding in the bottom and top like a burrito. Place bundle on a piece of foil and wrap tightly. Prepare pressure cooker by pouring water in the bottom of the pot ad fitting it with a rack so the lau lau will not touch the water. Place bundles in pressure cooker and cook for one hour. If luau leaves are hard to find in your neighborhood, try substituting any hearty green like collards or kale.